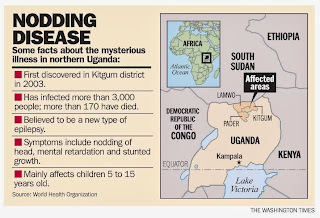 The Nodding Syndrome (also known as Nodding Disease) first emerged in Sudan in the 1960s. It is currently restricted to small regions in South Sudan, Tanzania, and northern Uganda. It is a mentally and physically disabling disease that only affects children, typically between the ages of 5 and 15. It usually ends with the death of the patient. Its etiology is unknown, therefore a cure cannot be found. The symptoms include permanent and complete stunted growth of body and brain. The latter leads to a severe mental handicap of the affected child. The disease is named nodding syndrome due to the characteristic, pathological nodding seizure, which often begins when the children begin to eat or sometimes when they feel cold. These seizures are brief and halt after the children stop eating or when they feel warm again. These seizures can manifest themselves with a wide degree of severity. Scans of the brains have shown atrophy and damage to the hippocampus. One theory about what causes the disease is a possible infestation of the parasitic worm Onchocerca volvulus, which is prevalent in all outbreak areas. The worm, technically a nematode, is carried by the black fly and mostly causes river blindness. 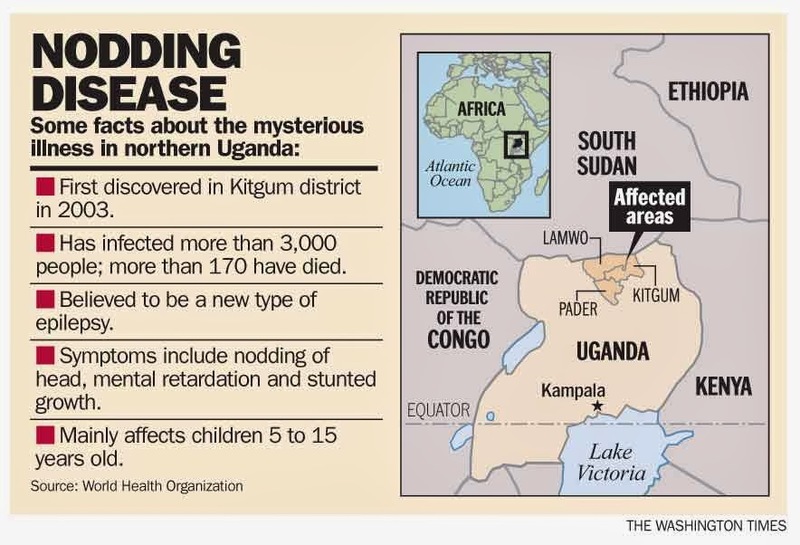 Most children suffering from nodding disease lived close to the Yei River, a hotbed for river blindness, and almost all of nodding disease sufferers were found to harbour the parasite. But this theory is just a theory and the latest scientific news is: Nodding syndrome is an unexplained epidemic epilepsy.